Well hello and welcome back, it's good to see you again! It was CASE'd (Copy And Share Everything) from an Australian demo Kylie Bertucci, and I changed it up a little. And some of the ladies even changed it again, which I love it when they do that.... it shows they feel comfortable enough to put their own style to it! As you can see we have a wonderful time during class, it's very casual and relaxed and there's lots of chatting, laughing and friendships made. The venue is so light and spacious that you aren't squashed in. 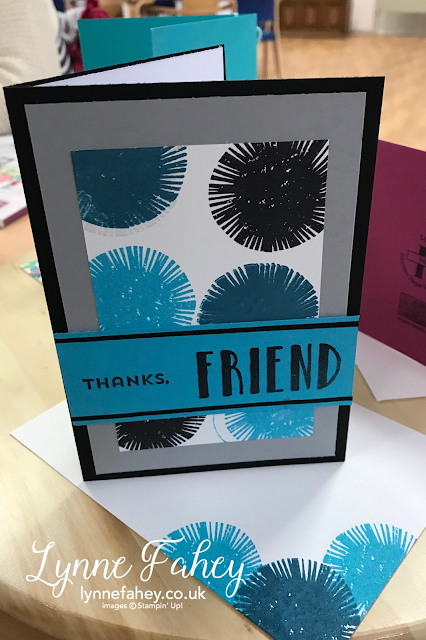 Instead of cutting three layers of card for the "layering effect" on the sentiment, all I did was stamp in black on the Tempting Turquoise cardstock and then flip my rule upside down so the numbered edge doesn't touch the paper and I ran my black marker pen along the ruler to create the illusion of turquoise/black/turquoise layers.... what do you think? The ladies loved that idea. And especially if you are posting cards, the less layers the cheaper it is to send! My card sample is the one of the right (above and below) and the pictures shows how you can remove elements to make it look so different. This stamp set is NEW and from page 157 of the 2017-2018 Annual catalogue. You get 12 stamps for £18 (clear mount) and I adore the sentiments and shapes. And I am sure I will use this set lots. 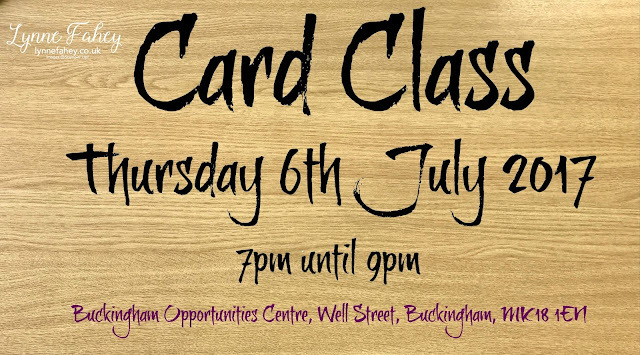 If you would like to come to my next card class on the 6th July, please email me: lynne.fahey@gmail.com to book your place. For every £1 you spend on retired product you get to choose that same amount on brand NEW product from the new catalogue..... how awesome is that?? It really is a good sale, and if you don't want to buy at full price to get the FREE product you can always make me an offer because I'd love to reduce the amount of space the Retired product takes up in my petite home. Please let me know if you can make it so I don't end up being "Billy-no-mates" for two hours!! Thank you for stopping by, and see you again soon!